This miniature Gambels Quail is a native of western Colorado. Quails are common field birds but not often seen because they like to hide as they forage. He is made out of basswood and mounted on Hand Cut Travertine, mounted on a Hand Made Walnut base. The Quail itself is only 1" x 1" in size. An interesting corner of the hand cut Travertine is the individual crystals of travertine which are easlily seen. Most of the travertine is solid but this corner was not totally solidified at the time it was quarried. We thought is was so interesting we did not want to cut it off to make the stone square. When Tom carves the top not on the Quail's head I am sure he holds his breath to make sure it will not break off. He has to work with and analyze the grain in the wood before he starts to make sure he had the strongest direction of the grain for all skinny parts so they will not easily break as he works. 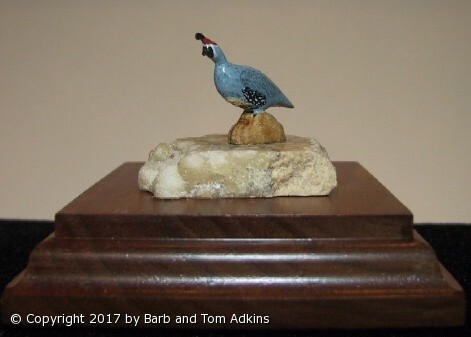 Tom also makes these Quail as mounted unpainted pieces because he likes the grain of the wood to show and not be painted. Please see the supplemental pictures. Size: Base is 3"x 3" Total height is about 2 1/2"